Do you know all the pumpkin seed benefits? During the fall, many people will roast up some pumpkin seeds. These are a warm tasty treat that has many health benefits. Pumpkin seeds promote prostrate health, better bones, arthritis relief and lowers cholesterol just to name a few. After you scoop out all the seeds to get to the raw pumpkin for your recipe, don’t throw out the seeds. There are many pumpkin seed benefits. Plus the seeds are so tasty and fun to eat during the holiday season. Pumpkin seeds, also called pepitas, are dark green, flat seeds which are sometimes enclosed in a yellow-white husk. The pumpkin, like cantaloupe, cucumber and squash, belong to the gourd family. Like the raw pumpkin, the pumpkin seed benefits are many. With similar nutrients like magnesium, phosphorus and iron, the pumpkin seeds are a very healthy food and make for a yummy and fun snack. For you men over 50 helping carve pumpkins this Halloween, be sure to save those seeds. Pumpkin seeds help promote a healthy prostate and minimize the issues such as urination problems due to an enlarged prostate. Prostate problems are most common in men over fifty. The magnesium in just a quarter cup of pumpkin seeds contains almost half of the daily recommended amount of magnesium. Magnesium has shown to help with blood pressure. This helps prevent heart attacks and stroke. It is estimated that 80 percent of Americans are not getting enough of this important mineral. Pumpkin seeds are rich in healthy fats, antioxidents and fibers. These elements help with heart and liver health. Although tis the season for scary ghosts and skeletons I’m not talking about a great looking skeleton with good bones hanging on your door for the “tricker treaters”. I’m talking about your bones. Another pumpkin seed benefit is giving you healthier bones. The seeds are high in zinc and are a great natural resource for this much needed nutrition. Low levels of zinc are one of the links to osteoporosis. In a recent study pumpkin seeds showed the same anti-inflammatory benefits as the non-steroid drug indomethacin. The good news on these results is that the pumpkin seeds did not have the same negative effect of damaged fats (lipid peroxides) in the lining of joints like the anti-inflammatory drug. Okay, so this study was conducted on animals, but the healing benefits of pumpkin seeds for arthritis relief is a potential benefit to humans. Another known pumpkin seed benefit is their ability to help lower LDL “bad” cholesterol. That is because the seeds have phytosterols, a compound that not only helps lower cholesterol but helps protect against certain cancers. 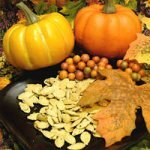 In addition to pumpkin seeds, many other nuts and seeds have the phytosterol compound including pistachios, sunflower seeds, sesame seeds, English walnuts and Brazil nuts. You know how tired you feel after eating your Thanksgiving dinner? This is in part from eating a large and yummy meal. It is also due to the tryptophan in the turkey. Well another pumkin seed benefits is that it contains tryptophan. Your body converts this into serotonin. This in turn converts into melatonin, also known as the sleep hormone. So you can get a more peaceful sleep by eating some pumpkin seeds. By baking at a low temperature, you are more likely to preserve the essential oils and get all the health benefits of your pumpkin seeds. You can add your seeds to your favorite salads, sprinkle in your soup or chili, add to your sautéed veggies or just eat them as is. In addition to the pumpkin seed benefits, learn what benefits you get from the pumpkin itself. Get up and get exercising for even more health benefits. Adding exercise to your diet plan can help you reach your goals faster. Use these tips to eat healthy all year long. Eating the right foods can help you feel better as well as help you with your weight loss program. Check out these fall recipe ideas to see how you can use your pumpkin.